Often referred to as the prettiest town in Ontario, Perth is named after the city of Perth in Scotland. 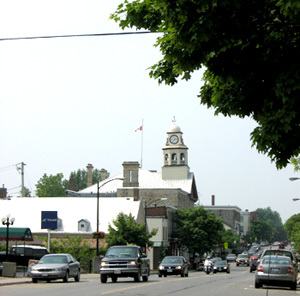 It is located in Lanark County, on the Tay River (a branch of the Rideau). Founded in 1816, Perth was developed through military settlement – soldiers and officers were granted pieces of property by the government (according to their rank), as an incentive to settle. Looking forward to its 200th Anniversary in 2016, Perth today is home to a strong, yet diverse community, enjoying a plethora of community events, fast economic development, and thriving tourism. Among the main attractions of Perth you’ll find the local museum (where you can learn about archeology first-hand) and a historic golf course (which is now a wildlife reserve). Stewart Park, located in the heart of the town, just behind the Town Hall, is an ideal place for picnics or a refreshing swim. It is also great for music lovers as it regularly features band concerts. Whether you decide to aimlessly walk the 19th century Main Street and simply take pleasure in the beautiful architecture or enjoy the spectacular natural open spaces, be sure to have your camera ready as the numerous cultural attractions, festivals, and outdoor adventures are awaiting for you to create unforgettable memories.